Behind a kiss there is not only the work of 35 facial muscles, but also a lot of history of literature and cinema. Therefore, to celebrate this extraordinary exchange of feelings, microbes and pheromones among human beings, every July 6, since 1990, it’s the World Day of the kiss. British wew the first to celebrate it; however, the event that tends to celebrate the most simple and pure love has taken over the world a little. 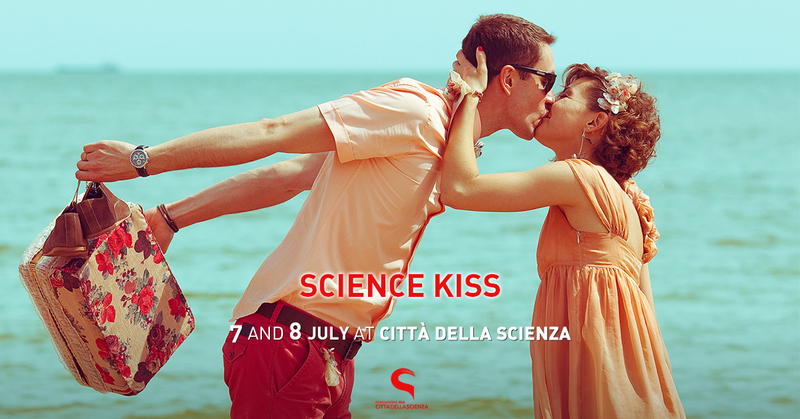 On the 7th and 8th of July at Città della Scienza we will discover the origin, the benefits of receiving and kissing, the effects of kisses on our hormones and on the brain and lots of other curiosities. We are waiting for you with a weekend full of emotions, passion and love! Thanks to a special path in eight stages among the Corporea exhibits, you will be able to discover everything about kisses: why psychologists and doctors say that kissing is good? How long has the longest kiss lasted in the world? What are the seven most beautiful kisses in Hollywood? Saturday and Sunday discover the Science of the Kiss in “A path …getting Kiss!”. During a passionate kiss, two lovers exchange hormones, microbes but also DNA! It is appropriate to say that in love you share everything, even your own DNA! The partner passes to his sweet half of his DNA that remains recognizable for at least an hour. Undergo the most “sweet” of experiments and you can bring home the DNA of your love. And if you have not yet found “the other half of the apple”, do not worry, we will still extract the DNA from your spit! It will be great to see the “code of life” right in front of your eyes. Follow “DNA & the Trace of Love!”. And for the little ones who will accompany their parents on this day dedicated to kissing and love, scheduled “Color Hearts” where they will discover the anatomical peculiarities of our heart and have fun painting hearts, but strictly in color! Free your imagination! Lovers have always expressed their love towards their partner by writing sweet words and romantic phrases. Scratch a surface to leave your sign of love. Try your hand at Street Art, discovering its history, the most important contemporary artists and Neapolitans and leave your mark! “Graffiti d’Amor” awaits you! All animals have three primary needs: Feeding, Not Feeding and Reproducing. Among these three, it is above all the last to be “the driving force of life”: being able to pass their genes to future generations. To succeed in this mission, Nature has many possibilities, and fortunately, in the non-human animal world there are no prejudices. If we human beings believe that we have explored every possible amatory practice, it is only because we do not sufficiently know the extravagant options that the animal world grants … “When nature is loving nature …” is the scientific study aimed at exploring all the strategies of mating, courtship and sexuality of animals! You will discover beautiful ones! It often happens to feel attracted in an ineluctable way by a person … As if you were two magnets! Investigate the laws of magnetism in “Fatal Attraction” through simple and fun experiments reproduced with recycled materials and discover why “opposites attract”! It is often heard saying Love is good, that Love make people younger! Even if it is not 100% realistic, the feeling of well-being that you feel when you’re in love is priceless … There are animals that retain their youthful form throughout their lives, even if they are not in love. They are amphibians similar to salamanders but with peculiarities that make them unique and funny in their appearance: they are the Axolotl, protagonists of “When Love make younger“. Beyond the visits they guide a Corporea, the first interactive museum on the Human Body in Italy, the 2D show “From the Earth to the Universe – From the Earth to the Universe” to discover the most important theories elaborated by man during the time in the astronomical field up to the future perspectives, and for 3D lovers, “Robot Explorers” is waiting for you to travel together, lander and orbiter inside our solar system.